Powdered caffeine in individual sachets. Unflavoured. Food supplement. 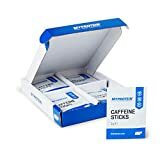 Myprotein Caffeine Sticks contain 200mg of caffeine per stick, and can be used for a variety of means, throughout the day. These caffeine sticks will help to increase your alertness and improve concentration, to ensure you remain on top form throughout the day, whether it is in the office or on the training pitch. Contributing to an increase in endurance performance, we recommend using these caffeine sticks before running or cycling to ensure you get the most out of your body and training schedule. Incredibly convenient, simply pour the powder into your beverage of choice.